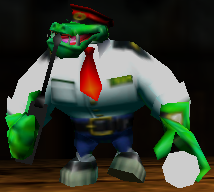 Kops are large, burly Kremlings who only appear in Donkey Kong 64 during the minigame, Stealthy Snoop. They wear security guard outfits, a red tie, blue jeans, and a red hat covering their eyes. They hold a flashlight in their left hand and a handheld transceiver in the right hand. Kops patrol the maze with their flashlight, keeping an eye out for the Kongs. The objective of Stealthy Snoop is for the active Kong to carefully navigate through the maze to cross the checkered flag without being caught by a Kop. If the Kongs get caught under a flashlight, they lose at the mini-game. When a Kop catches the Kong, it calls for backup on its transceiver. Despite their minor role, a Kop appears in a group artwork, where Donkey Kong and Diddy Kong are hiding in a corner from one shining its flashlight down the following path. Group artwork of Donkey Kong and Diddy Kong hiding from a Kop. This page was last edited on April 9, 2019, at 14:22.